In this solo dining adventure, Gary has dinner at Book Bindery, a new restaurant from Per Se alum Shaun McCrain. The story of where I had dinner on my final night in Seattle is an interesting one – well, at least to me it is. I had made a reservation for Olivar in the Capitol Hill neighborhood. It was one of the suggestions i got from the Chowhound thread I started and the menu of Spanish tapas looked like it’d be a winner. On my second to last night in Seattle, I stopped in at a restaurant after a Mariners game for their late happy hour $1 oysters special. While I sat at the bar, happily slurping up my oysters, I couldn’t help but overhear a conversation two ladies at the end of the bar were having with the bartender. They were talking about the dinner they’d just had at Book Bindery, a brand new restaurant that had opened up that very night. Everything they were saying about the restaurant sounded great but when the bartender mentioned that the chef behind it was Shaun McCrain, the former executive sous chef of Thomas Keller’s Per Se, I knew I had to make a visit before I went home two days later. So, sorry Olivar, but Book Bindery bumped you off my list for this trip. I was rather surprised that opening night was the first I’d even heard of the place. As the opening of Lincoln in New York City approached – a restaurant helmed by another Per Se alum, Jonathan Benno – there was non-stop coverage among all the industry blogs. And, yet, nothing I could find on Book Bindery on the web really except for a few pieces on the Seattle Magazine food blog. It was absolutely under the radar by any standard, whether it be in food media ravenous New York City or even the less rabid Seattle food blog scene. Which is exactly the way partner Patric Gabre-Kidan told me he wanted it. He basically said that he wanted the restaurant to succeed without any preconceived notion about how successful or good it should be. I interpreted that to mean that he wanted Shaun to have every chance to do what he wants in the kitchen without worrying about the hype. That approach may seem timid but, hey, whatever works, right? And at Book Bindery, it works. 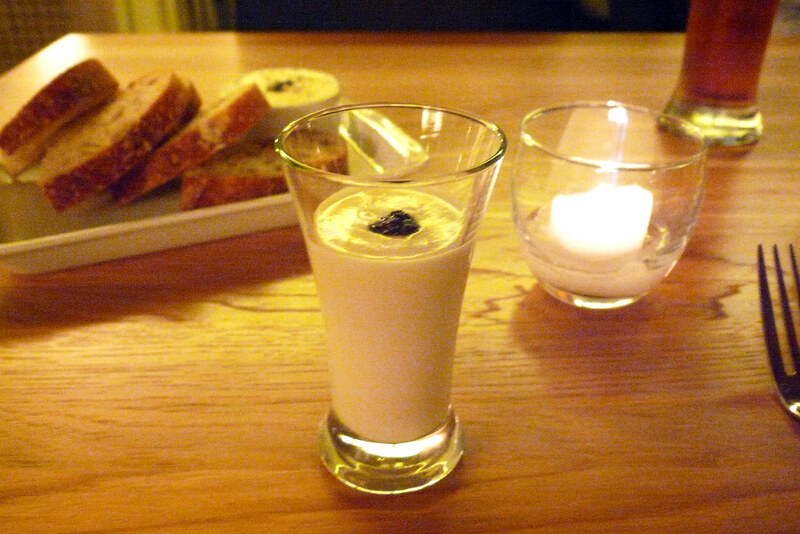 Shortly after ordering, along with the requisite bread and butter came this amuse of a cauliflower soup shooter. The soup also had truffle oil in it as well as a little piece of black truffle on top as a garnish. I actually didn’t hear my server mention the truffle oil being in the soup as well, thinking that the truffle piece was the only thing truffle in the amuse. Well, one quick sip is all it took for me to realize otherwise. Definite truffle flavor in this soup. Also definitely wonderful. If I’d been smart, I’d have broken some of the bread on the plate so I could make sure I got every last drop of soup out of the glass. After the wonderful start that was the cauliflower soup amuse, I just hoped that the rest of the meal could top it. My first course, the sweetbreads, did a darned good job at starting the upward trend. 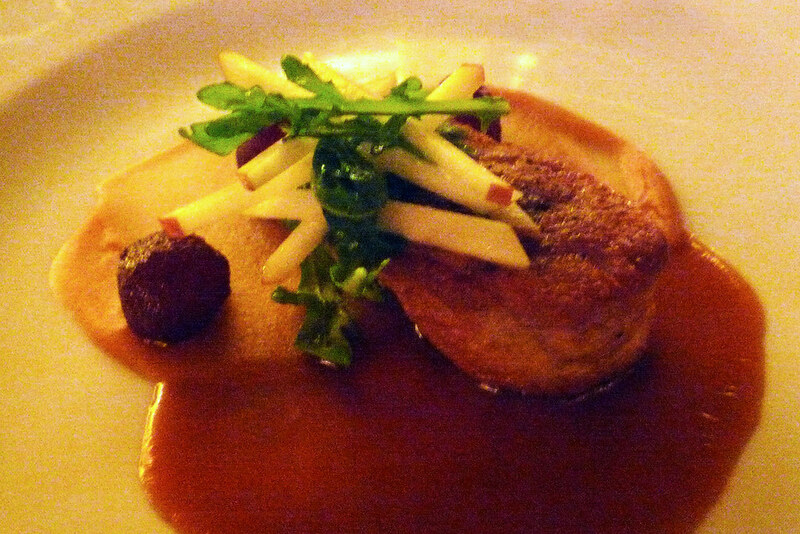 The sweetbreads sat on a caramelized apple puree and were topped with julienned apple matchsticks and wild arugula. My usual experience with sweetbreads tend to be of the fried variety so it was nice to see this beautiful, plump sweetbreads that’d been seared to a crisp on the outside but soft on the inside. It was well-seasoned and the caramelized apple puree enhanced the flavor – it was an absolute pleasure to swipe each cut portion of the sweetbreads through the puree. Finally, there’s the entree, a braised lamb shank served with panisse croutons, fried artichokes, and slow-roasted tomato with everything sitting atop a lamb jus. The above photo does a terrible job at conveying just how great this dish looked when it came out. 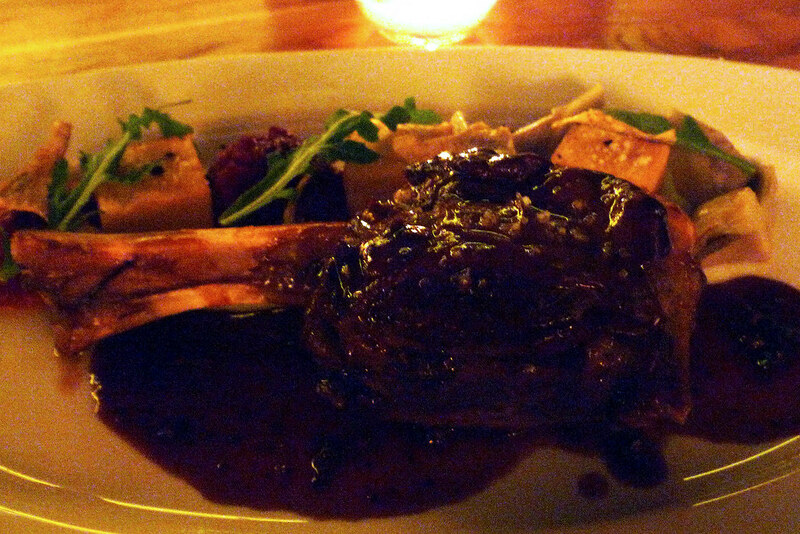 The lamb shank itself was beautiful but it’s the arrangement of the slow-roasted tomato, croutons, and fried artichokes at the top of the plate that really stole the show, presentation-wise. The lamb was juicy and the meat came off the bone really easily – a good thing because I wanted every little scrap of meat I could get off it. I really loved the slow-roasted tomato. I wouldn’t bother cutting into it – just pop it into your mouth for an explosion of concentrated tomatoey sweetness and acidity. 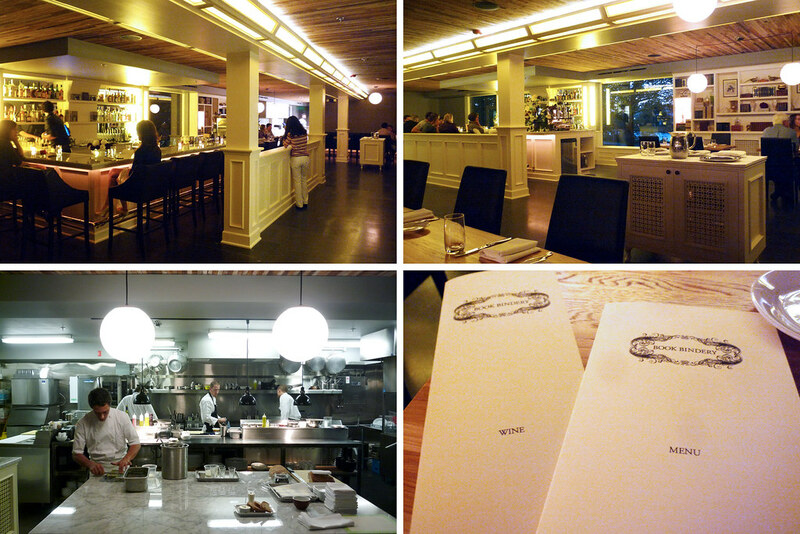 Dinner at Book Bindery was, without a doubt, the best meal I had when I was in Seattle. All the dishes were executed spot-on – not just in flavor, but in presentation as well. The service here was excellent for the most part, especially when you consider that it was only the second day of business. The one hiccup was the lack of silverware when the lamb shank came out but that was quickly remedied so that I never would have noticed if they hadn’t mentioned it. And the music here was awesome – kudos to my server Niko and her ridiculously cool playlist. A final word on the hype or the lack thereof – I’m glad there wasn’t much of it because I would hate to have missed out on a meal here because of a jam-packed reservation book. I just hope the word-of-mouth spreads because this is a place deserving of plenty of business. Book Bindery. 198 Nickerson Street, Seattle, WA 98109. [Show/Hide Map] (206) 283-2665.